The TreeHugger data logger is a unique unit design specifically for long-term deployment with the TreeHugger dendrometer. The data logger is engineered with components rated for -20 - 80 C environments, and these industrial rated components are sealed under a layer of conformal coating, a thin layer of waterproof film to prevent damage from moisture, making it ideal for environments where tree growth is present. Data is stored on a MicroSD card. These types of cards are very popular and can be found at most stores. These large capacity cards allow a minimum of several hundred thousand records providing more than adequate space for records of 15 minute intervals. The best results from bench test were from Kingston brand HCSD cards lowering the average sleeping current from 175uA to 125uA. Toshiba HC cards showed large current consumption during sleep, >1mA. The TreeHugger data logger includes an 18bit analog-to-digital converter. When paired with 100mm SoftPot and excitation channel from the data logger, the ADC has a resolution of greater than 2um. A 3.5mm jack/cord is used to provide accurate readings. With larger contact area and more secure mating to board than RJ-11 or RJ-45 connection, a 3.5mm headphone jack/cord offers superior connection quality to sensors. Timing is critical when recording data over long periods. Most electronics suffer drift from their internal clocks. This is most apparent in computers without internet and PLCs in factories. This is why an extremely accurate time clock was used in the data logger. It has an integrated temperature-compensated crystal oscillator to provide accurate timing in the most drastically varying temperatures and climates. The data logger requires 2 "AA" batteries or a 5.5mm OD barrel jack capable of supplying 2.7-3.3V at 25mA (100mA wireless). Battery life is determined by type/number of sensors and interval settings. When using the data logger at 15 minute intervals with the TreeHugger (SoftPot and Thermistor), the expected battery life is 6 months. These results can vary depending on environmental conditions. Power management is achieved through a 3.3V 200mA switching regulator. This regulator is only used when power management is required by components such as the ADC or RTC. 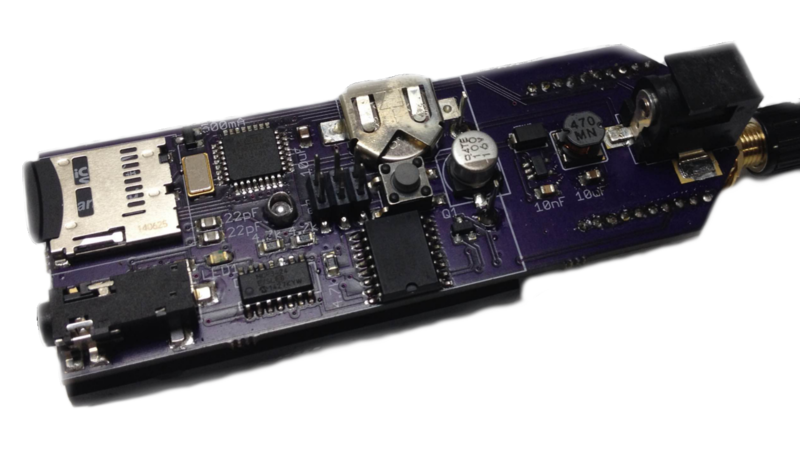 The micro-controller is capable of running off a wide range of voltages allowing the regulator to be switched off during sleep cycles conserving more power. The TreeHugger data logger has the capability of accepting an xBee wireless unit. This xBee unit is detected on start-up of the data logger. When present, the logger operates in wireless mode transmitting the collected data through a mesh network of xBees to the designated base address.